Nowadays, thousands of people make a living from blogging – now, it’s your turn! Even though it takes some time, the process is not that hard and there are many ways to do it. In this tutorial, we will show you how to make money blogging. Before you learn how to make money blogging, you need to complete a couple of steps. Having a niche means that your blog will focus on a certain interest rather than multiple topics. You may wonder why this step is necessary. Whether people stumble onto your blog via search engines or found it because of shared interests, they stay on your blog for the content. So don’t try to write about everything, as it will only drive traffic away. This way, your audience know what to expect from you and will continue visiting your site. They may even be inclined to share your post to their social media – which adds a boost to your traffic! A proper niche will help you make money blogging faster. Aside from niche, a domain name will also define your blog’s identity. A great way for choosing a domain name is by making sure that it lines up with the niche you choose. For example, if you start a blog about fashion, you’ll want a name that sends a clear message such as www.mydailyfashion.com. Moreover, a domain name that contains the mostly-searched keywords will help your blog rank better in search engines. Be sure to invest some time and effort in choosing a domain name. If you’re stumped, you can make use of available domain name generators out there for suggestions. Once your mind is already set on a niche and a domain name, it’s time to create a blog that’ll turn into a money-making machine. You need two things for this: web hosting and a blogging platform. There are a few hosting types to choose from. If you’re just starting a blog, we recommend you to use our shared hosting as it’s the most beginner-friendly. Plus, you’ll get a free domain if you purchase it for a 12 months period. For the blogging platform, WordPress is the best way to go. It’s the most popular CMS (Content Management System) that has a steeper learning curve but offers the most functionality. Read our detailed guide on how to create a blog. Now that you have created your blog, the next step would be filling it with good content. To keep your readers engaged, you need to maintain both the quality and quantity of blog posts. We know that it can be daunting. That’s why we have a list of what you can do to achieve such a feat. Find out which format works the best – for example, try to create a post such as “How To Do Something in X Minutes”. Engaging titles and well-structured content is very important. In addition, you can also read more about how to come up with blog ideas. In the end, it’s up to your readers to decide whether your blog is worth another visit or not. That’s what you should be focusing into – make your readers feel welcome! First, make them more active by adding call-to-action to your posts. For example, invite the audience to leave a comment. It’ll give you a chance to engage with them by replying to their comments – or solving the problems they have. Another way to do this is by making opinionated articles. Some of your readers may disagree with your view, but that makes for an open discussion – opening up a wide chance for audience engagement. The more traffic you have, the faster it is to make money blogging. Many bloggers out there have done a few working methods in attracting more readers. Follow these methods to get more traffic so you can start earning money as soon as possible. We have mentioned SEO a few times earlier, but what is it exactly? Search Engine Optimization is a practice used to make your website appear on the top of the search engines’ result pages. Google has its own algorithm that curates which site deserves to be on top of the list. Despite no one knows how it exactly works, there are a few factors that can help you rank better. If the organic way of SEO doesn’t give you the needed traffic boost, why not pay for it? By using paid ads, you get to run a PPC (pay-per-click) campaign that generates tons of visitors to your blog! So, how does it work? Well, it’s similar to the ads you see on TV but there’s a slight difference. Instead of paying in front, you only pay when someone clicks on your ads. What’s better, there is no jumping through hoops – find an ad service, sign up, and start advertising! Below are several popular advertising services for you to decide on. Bing Ads – why settle for one search engine? Make your blog appear on Bing, Yahoo!, and AOL at once! You know what they say – the best things in life are free! Give your audience some treats and they will start marching to your blog. Giveaways are when you make people do things for your blog – either by promoting your blog, joining their email newsletters, etc – in exchange for a free item. The best time to this is holidays – like Christmas or Thanksgiving for example. Use those events as your theme, pick a suitable prize, set some rules, and announce it on your social media. After that, all that’s left to do is picking the winner. Pretty easy, right? Pro tip: Bring giveaway plugins into play! There are some useful ones such as Simple Giveaways and Gleam. You don’t want to confuse your audience. Why would you give a free gaming console in your food blog? Make sure they’re worth the effort. Cheap stuff won’t generate much interest. Giveaway is a surefire way to gain traffic in blazing speed. Plus, it opens up a way to engage with your audience more. Although, there’s no stopping them from leaving after participating. You need to make sure that doesn’t happen – do a follow-up, make great content, engage more with them, etc. After you have gotten enough traffic, it’s time to do the work that can actually make you money! So, how to make money blogging? Here are some of the best ways! Earlier, we mentioned to pay for ads to get traffic – now, it’s the other way around. Placing ads on your blog is a great way to make money blogging. Google AdSense is a PPC (pay-per-click) program that allows you to display ads on your blog. It’s one of the most convenient methods as Google will take care of almost everything: which ads to display, the billing process, etc. Plus, you get to customize which types of ads fit your blog. Here’s how to put an ad in your blog. Wait until your account is approved. The signing up process may be quick but it takes up to three days for Google to verify your account. Start creating your ads. Once your account is verified, you’ll have access to the Adsense dashboard. Head to My Ads >> New ad unit and customize your ads – the name, the size, and the ad type. Copy-paste your ad code to your blog. You can do it manually by navigating to Appearance >> Widgets and add Custom HTML. Place the widget to any section and paste your code there. Alternatively, you can make use of the Ad Inserter plugin for that. Make sure to put your ads where your audience can see them right away. Now that the ads are on your blog, wait for them to get enough clicks. Sooner or later, you will reach the minimum amount ($100) and you’ll get paid by the end of the month. If your blog has plenty of traffic, there will be sponsors who want to do business with you. It is a fantastic way to make money blogging. Basically, you get paid by your sponsor (e.g. a company) to publish articles. What’s in it for them? Well, the kinds of articles are designed to help them get more customers – either in a form of reviews, announcements of new products, sales, etc. So, who will be writing the articles? That depends on your agreement with your sponsor. If they want to hold you responsible for the content creation, you may want to charge them more. Let’s take a look at these steps to use sponsored content to make money blogging. Make an analysis report on your blog. If you expect companies to pay you, then they’ll be expecting results. Show them how well your blog is doing – pageview counts, bounce rate, etc. Offer your services to local businesses. For first-timers, we suggest you build your portfolio before taking on big corporates. Alternatively, you can find potential customers in sponsor market sites such as Cooperatize and Tomoson. Be sure to match the sponsor with your niche. Negotiate your price. You can use the report to determine your fee. Also, base the number on your level of expertise, the amount of effort put into perfecting your blog’s design, and whether you’re in charge of content creation or not. Publish the sponsored post. If you’re in the U.S.A, the law requires you to state that you’re writing a sponsored post. Plus, make sure to match the article’s tone and style with yours. That’s it! The more you do this, the sooner you can take on companies that are willing to pay a lot more. Although, you may want to wait before publishing another sponsored post – overdoing it may reduce your traffic. Sponsored content is one of the most popular ways to make money blogging. Affiliate marketing is one of the most popular ways to make money blogging. This method is quite similar to sponsored content. You need to write an article that will benefit a business you partner with. There’s a slight difference though – instead of the negotiated fee, you get paid through the number of clicks or sales made via affiliate links. Choose an affiliate program. There are many popular ones such as ShareASale, eBay Partners, Shopify Affiliate Program, and so on. Plus, you can also consider Hostinger Affiliate Program where you get 60% commissions for each sale. Lead your readers to click your affiliate link. 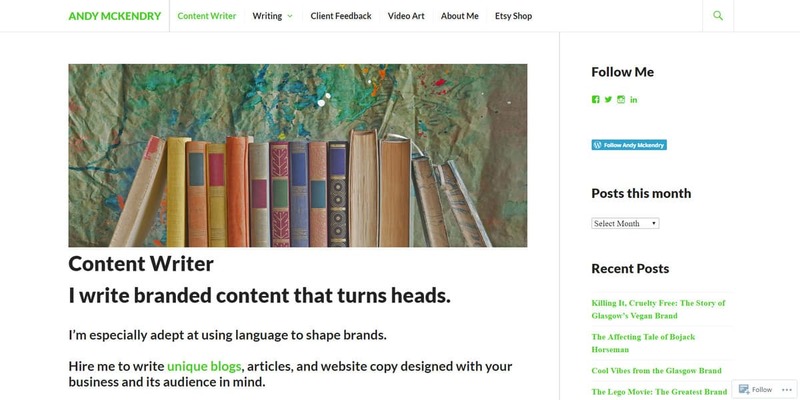 Write a compelling review of a product or service. The more clicks you get, the more you’ll earn. Also, make sure to be transparent – say that it’s an affiliate post. Trust plays an important role in affiliate marketing. Grow your e-mail newsletter subscription. You can reach a much wider audience by personally delivering the content to their inbox. It’s an effective solution to gain loads of clicks. Prioritize your audience. If possible, you should try the product firsthand. If you don’t like it, your audience may not either. Boasting about bad quality products will hurt your blog’s reputation. Another thing to consider is to make sure the product lines up with your niche to keep your brand intact. Also, there are useful plugins that can make the whole process a breeze such as ThristyAffiliates and AffiliateWP. 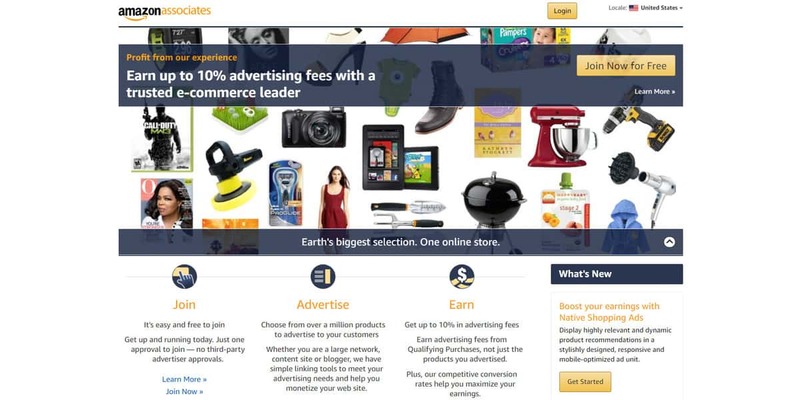 If you want to make money blogging with affiliate marketing, try one of the most popular affiliate marketing programs – Amazon Associates. To earn make money blogging with it, you just have to advertise a product from their site using the affiliate link. For every purchase made through your link, you will earn referral fees. What’s interesting is how each product category has a different amount of fees. If you’re planning to use Amazon Affiliate from the beginning, it’s best to set your niche based on the highest fixed rate. Plus, they have a few special programs that only require free trial registration for you to gain commission – Kindle Unlimited, Prime Pantry, Amazon FreeTime, and many more. Follow these simple steps to start gaining a commission from Amazon Associates. Sign up on Amazon Associates. The process is free, easy, and doesn’t take much of your time. Setup your profile. Fill out your account credentials. Click on “New Customer” and enter your information such as your name, address, phone number, how you attract visitors, payment method, etc. Get your affiliate links. After you successfully created your profile, look for a product and click on “Get Link”. You can make the necessary adjustments here – ad types, size, color, etc. Copy-paste the link to your blog. You can put it on your sidebar, in your articles, on the header, and so on. Amazon Affiliate is among the best affiliate programs out there. If you like to make reviews or convince people to buy, you’ll feel right at home. If you have a knack for entrepreneurship, why not putting up your own products for sale? It’s a great way to make money blogging! However, it won’t be the most convenient choice. There are just too many to handle – shipment, restocking, packaging, and so on. Don’t fret, because you won’t run into these problems if you sell digital products instead. It typically requires less staff, you won’t run out of stock, and you can ship the product in a jiffy. What’s not to love? What’s more, there are just tons of digital product types you can choose – from ebooks, photography, artwork, music, to software and even online courses. So, how to sell digital products? Check out these steps below. Decide on what to sell. Do research on the market to see what sells the most – and at what price. At the same time, make sure it’s something of your expertise or niche. Make use of suitable plugins. The notorious WooCommerce plugin will fit right in for your needs. Start selling. Display your products in an interesting format such as a listicle or a how-to. Don’t forget to write excellent copy in the product description. Do follow-ups. Make an automated response after each purchase to ask for their reviews and ratings. Selling digital products is a quick money-grabbing method with no hassle. However, coming up with the goods can be hard. If you don’t know how to create something, consider selling someone else’s products as a reseller. There are a few merchants willing to give you a discount for selling their stuff, and you get to raise the price – with each merchant’s condition. However, it still won’t be as profitable as selling your own products. Membership sites are a great way to make money blogging. Imagine Netflix – you have to pay each month if you want to keep watching their shows. That’s what membership site is all about! Even a mere few sales can still generate regular income for you. More importantly, you don’t even have to worry about traffic. Once your audience pays for your service, they will commit to visiting your site regularly. Neat, isn’t it? Also, there are a wide variety of fields you can pick for your membership blogs such as streaming service, software subscription, premium forum, and so many more. Creating it is easy – only requiring a plugin and some few adjustments, and you’re all set! Install the S2member plugin. It’s a free plugin with great functionality and deep customization that allows you to create and set up a membership site. Set up the membership site. From your dashboard, navigate to S2member -> General Options. Open each tab and make necessary adjustments. Make sure that everything is up to standard. Through the plugin interface, put in e-mail and payment methods, create the necessary pages, set various membership levels, and so on. Keep updating your site with fresh content. Otherwise, your members may cancel their membership at any time. Once you create a membership site, be sure to invest a lot in marketing. For your users, the idea of having a monthly expense can be a big commitment. You have to convince them your service will be worth their invesment. After blogging for a while, you may already have enough portfolio for people to entrust their writing projects to you. Freelancing is a great way to make money blogging. Besides, there is a huge demand for freelance writers – every business needs content to maintain their digital presence. So, why not pitch them with your best articles? Here are the steps that can get you started. Compile your best writing samples. Seeing is believing. A well-structured portfolio can improve your chance of getting hired. Set up a hire me page in your blog. Make yourself known to the world that you’re available to hire. Include some information such as your writing experience, what topics you excel at, and so on. Look for writing gigs. There are many ways to go around this – make a post in job boards, ask a local business directly, go to forums, and many more. Negotiate and start writing. Decide on the price, the deadline, and other related conditions. Then, give it your best in producing the best quality of content. Happy customers equal good money! It’s a great choice especially when you love writing. However, a good reputation can’t be built overnight. It may take a while before a high-paying company notices you and it surely takes high dedication to path your way toward success. Shed some light on your audience by sharing with them what you know. Not only is it a noble job, but you’ll also get to expand your network. There is no better way to engage with your readers than by showing them how to solve their problems – plus, you’ll get paid! Take a look at how to start offering tutor services on your blog. Install Tutor plugin. It’s an ultimate LMS (Learning Management System) plugin allowing you to create a tutoring site with no hassle. Set up your tutor site. Decide on which subjects you want to teach, the pricing, and which forms of material you want to use. Using Tutor, you can put video lessons, quizzes, progress tracking, and many more. Plan on a curriculum. There is material for every subject and grade. Make sure it’s properly planned and can actually help students get better grades at school. Finalize setting up. It’s important to make every material course ready before you show it to the world. Take your time and be sure that everything is up to standard. Launch your site. Go to relevant forums and advertise your service. Consider collaborating with other tutors to teach at your site. It may take hard work to set up teaching materials. But, if your course is easy to understand and covers all bases, students will be lining up to learn from you. Overall, tutoring is a great way to make money blogging. If you’re a better speaker than a writer, podcast advertising will fit you like a glove. There are a few advantages over the traditional form of writing. First, people will hinge on every word they listen – no skimming or speed-reading. Second, they’ll always have time to listen to podcasts, either while cooking, commuting, etc. It makes for a better alternative to advertise a product. Companies pay you for every 1000 audience who listens to your podcast – it’s called CPM (cost-per-millie). According to AdvertiseCast, the average CPM for podcast ads in 2019 are $18 for a 30-second ad and $25 for a 60-second ad. Interested in doing a podcast ad? Follow the steps below. Build your podcast portfolio. Make a lot of engaging podcasts first and use them to wow your potential customers. Announce that you offer podcast ads. Share the news to the public, ask your listeners to refer you, etc. Do some cold pitching. If you’re confident with your listener count, you can contact some companies to see if they’d want to advertise on your podcasts. Credibility plays an integral part in podcast ads – that’s why quality is a must! However, quality podcast requires you to have excellent sound-editing skills and good quality equipment that doesn’t come cheap. So, if you want to make money blogging via podcasts, you need to decide if you don’t mind to invest in this method. RSS stands for Really Simple Syndication – bloggers use it to distribute their content to the readers through subscription. If you subscribe to many blogs, you can keep in touch with their latest posts at once using an RSS reader. It’s convenient, right? 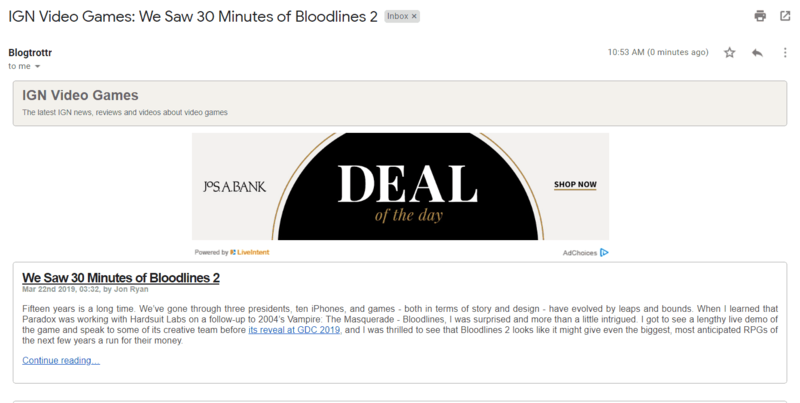 What’s interesting, RSS also enables you to make money blogging via ad placement. It’s similar to Google AdSense where you get paid for every click made. Follow these instructions below to make money through RSS advertising. Show your RSS buttons on your blog. It can help gain more subscribers. The more of them you have, the more likely it is to get many clicks. Pick the source of your ads. You can choose to use third-party advertising programs like Yahoo! Publisher Network or use the ads from your affiliate marketing program. Inject the ad codes in your feed. Normally, you’ll need to modify the core files to put your ads. That’s where RSS Footer plugin comes to play. It has a feature where you can put an HTML code in RSS footer. There you go! All you need to do is keep posting and the content – along with the ads – will be delivered to every subscriber. Such an easy way to make money blogging! Although, there aren’t a lot of people who use RSS these days. So, getting subscribers can be tricky. Those were some of the many ways you can earn money from blogging. So, which one of them do you like the most? Remember, each has its own pros and cons that you should consider. Now that you have known how to make money blogging, it’s time for you to try it. We hope that our guide is enough to motivate you. Happy blogging!